Comet lovers have much to look forward to in 2017 with six potential binocular comets and at least two others for modest backyard telescopes. 7th-magnitude 45P/Honda-Mrkos-Pajdusakova cut a fine figure on December 28th with a narrow gas tail pointing east. If you don't own binoculars, get a pair soon. I've gone over my list, checked it thrice, and come up with six likely binocular comets making appearances in 2017. At least one of these could reach naked-eye visibility. The first is returning periodic comet 45P/Honda-Mrkos-Pajdusakova, currently painfully low in the southwestern sky in late evening twilight but mustering a healthy magnitude +7. Several observers have reported seeing it with binoculars this past week, including amateur Scott Harrington of Arkansas who spotted it in a pair of 7×35s. Due to clouds, my last observation was made two weeks ago. 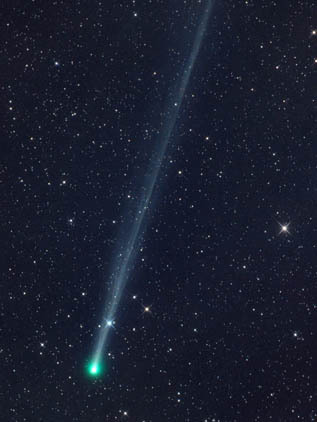 Then the comet appeared bright and well-condensed with a beautiful aqua-hued coma in a 15-inch reflector magnifying 64×. As reported in an earlier blog, 45P/HMP will show best in the early morning just before the start of dawn in February, when it could top out around magnitude +6.5. It will also be much easier to see, streaking from Hercules through Boötes over just a couple days as it makes an exceptionally close approach to Earth. 45P/HMP arcs across Capricornus this month; it should remain visible very low in the southwestern sky until disappearing in the twilight glow around mid-month. The comet returns to view at dawn in early February. Click the map for a larger chart you can print out. Click here for a February–March map. Positions are plotted at 3-day intervals at 0h UT. I hope you like getting up early because this week and early next will be your last chances to catch 8th-magnitude comet NEOWISE (C/2016 U1). Discovered last fall, this initially diffuse object has steadily brightened to become more compact and luminous to the point that it's now observable in small telescopes and even binoculars from a dark sky. Get out there soon! The comet is sinking fast into the dawn glow with only about a week left in its apparition. With an orbital period of thousands of years, no one alive today will witness its next return. Sniff. C/2016 U1 (NEOWISE) still looks much as it did when this photo was taken on December 9th — a round ball of fuzz with a brighter condensation at center. Time is running short to view the comet! C/2016 U1 responds well to a Swan Band filter, an accessory every serious comet observer should have. It blocks unwanted light while enhancing fluorescing molecular carbon gases in a comet's coma. Some comets produce a lot of gas and respond very well to the filter; others are less gassy and show little change in contrast. For a gassy comet at low altitude, the filter can be make the difference between seeing it or not. C/2016 U1 drops south rapidly in the coming days and soon disappears from view. 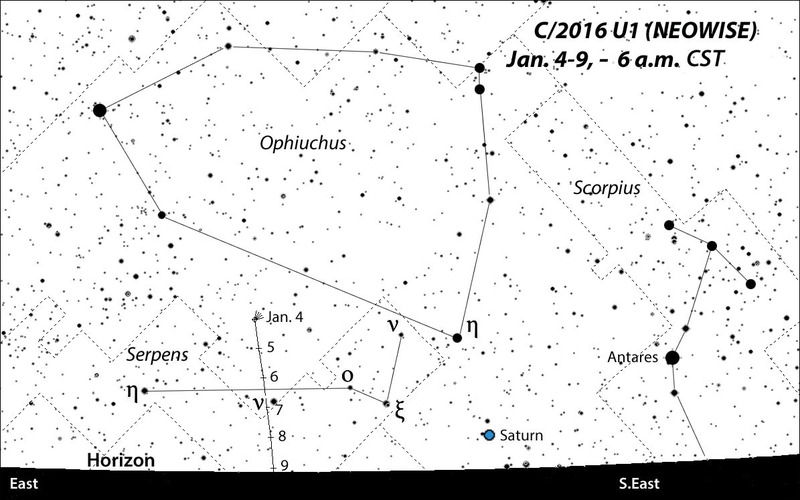 You'll need a good eastern horizon to spot the comet as it crosses from Ophiuchus into Serpens. Positions plotted daily with stars to magnitude +8. This map and the other "black on white" maps show the sky from latitude +40° N. The comet is plotted at 1-day intervals. Click to enlarge, then save and print out for use at the telescope. Periodic comets, those that lap the Sun in fewer than 200 years, are well represented this year. Next in line is the dashing little fuzzball 2P/Encke, which completes an orbit in a hurry, in just 3.3 years. 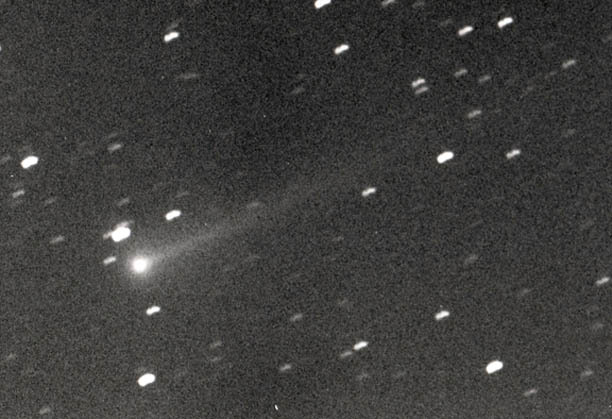 Encke always begins its apparition as a faint, diffuse mist but wastes no time brightening and compacting into a fine little comet suitable for small telescopes. 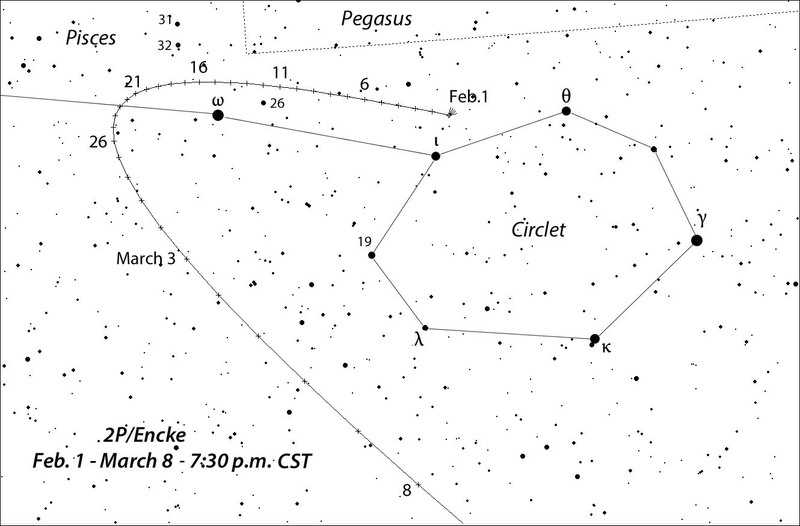 Watch for 2P/Encke to brighten to binocular visibility as it loops around the Circlet asterism in Pisces during early evening hours in February and March. Positions plotted daily with stars to magnitude +9.5. The comet was recently snared by visual comet observers in December, but still shines wanly at magnitude +12 at this writing. Watch for it to brighten to magnitude +9 by mid-February as it cracks the whip around the Circlet asterism in Pisces at nightfall. Soon after, Encke plunges south and becomes lost in evening twilight by early to mid-March even as it swells to a predicted magnitude of ~6.5. Just so we don't lose count, that's already three binocular comets and we're barely halfway through our list. C/2015 ER61 (PanSTARRS) may not look like much now (this photo taken December 8), but come perihelion on May 10th, it could become visible in binoculars low in the east at the start of dawn. Eager for more? Pull closer to the table. 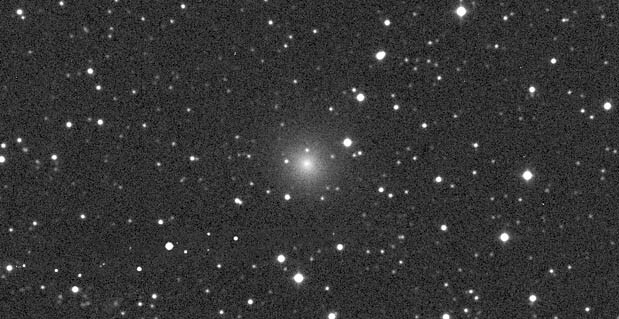 The next comet, PanSTARRS (C/2015 ER61), has created a flurry of excitement with some estimating it peak magnitude as bright as +2. Discovered as an asteroid in 2015, it was later shown to exhibit a coma and renamed as a comet. Most sources I've checked, including Seiichi Yoshida's excellent Weekly Bright Comets and JPL's HORIZON site, put C/2015 ER61 at magnitude +7 from mid-April through mid-May. No complaints here. Any comet visible in binoculars is a gift and every one of them looks even more amazing in a telescope. 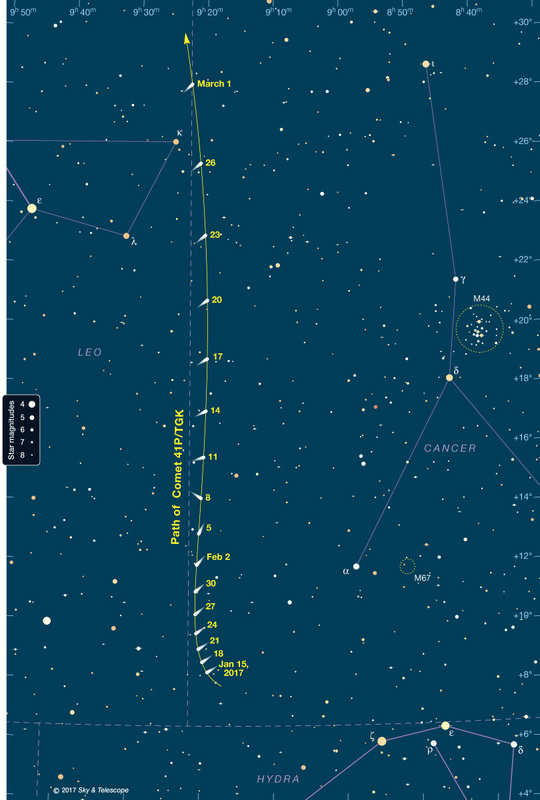 C/2015 ER61's path parallels the ecliptic throughout the year. It will be brightest in mid-spring but low in the eastern sky at the start of dawn throughout its apparition. Positions plotted at 5-day intervals with stars to magnitude +7. Still, some may struggle to find this cotton ball. Why? C/2015 ER61 has a serious altitude problem for observers at mid-northern latitudes throughout its apparition. The comet tracks along the ecliptic never far behind the Sun. This month, the 30″ diameter, 13th-magnitude comet creeps from Libra into Scorpius, keeping observers at bay until the very start of dawn, when it finally reaches a somewhat reasonable height above the horizon. When brightest in May, it will be crossing from Aquarius to Pisces. 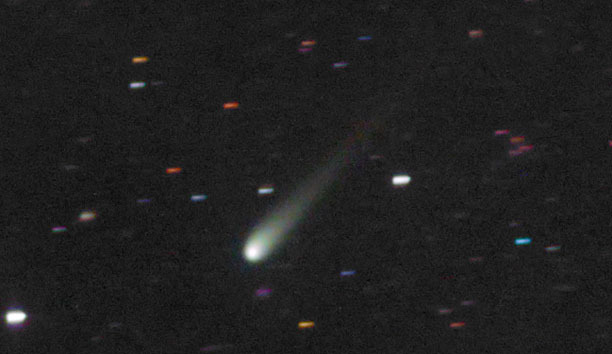 Comet Johnson (C/2015 V2) is currently well-placed in the morning sky for amateur observation. A short tail pointing northwest is visible in 10-inch and larger scopes. 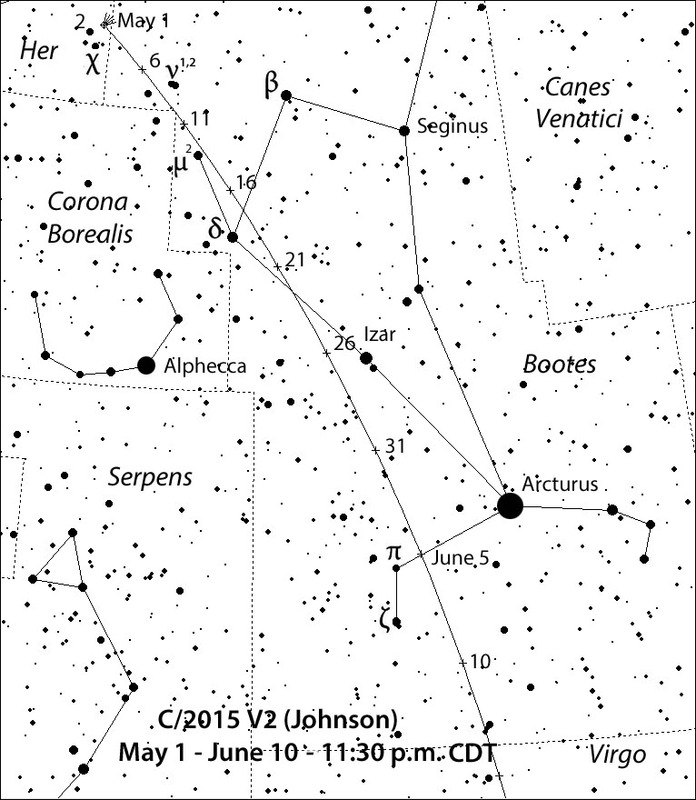 I'm got high hopes for a relative newcomer to the comet scene, Johnson (C/2015 V2), which may peak around magnitude +6.5 in early June as it slides down the eastern side of Boötes high in the southern sky before the mosquitoes return. Currently at magnitude +11.5, 1′ in diameter and moderately condensed, you'll find this comet warming up for its spring performance in the morning sky in northern Boötes. An 8-incher should coax it into view using magnifications of 100× and higher. 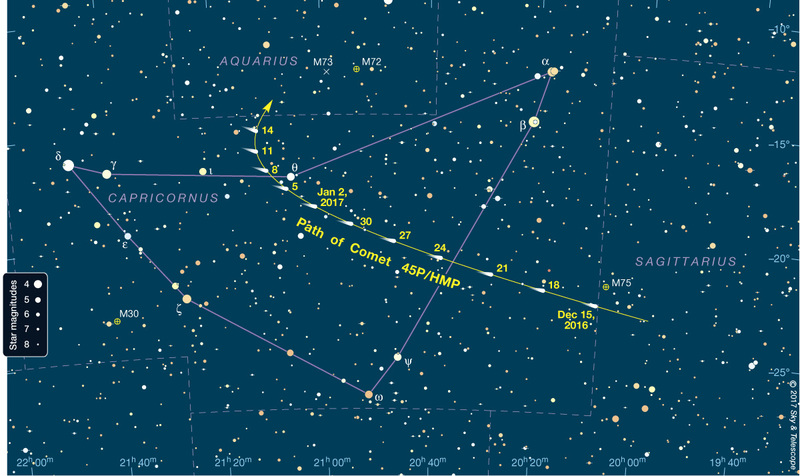 Comet Johnson (C/2015 V2 ) should put on a nice evening show during May and June as it races to a June 12th perihelion. Positions plotted at 5-day intervals with stars to magnitude +8. By the way, if you lack the software to create a comet path, you can always download the latest version of the free program Stellarium for Windows or Mac and pinpoint this and any other comet's position one night at a time. To ensure you have all the stars you need (down to magnitude 14 and fainter), click on the Configuration tab on the left side of your screen, select Tools, then download Star Catalog Updates. Comet 41P/TGK begins the year moving north along the Leo–Cancer border, where it's well-placed for viewing in the evening sky. Watch for the comet to brighten from about magnitude +12 in mid-January to +10 by early March. This chart is plotted at 3-day intervals for 0h UT. Click for a full-size chart. Click here for charts for March through June when the comet is brightest. 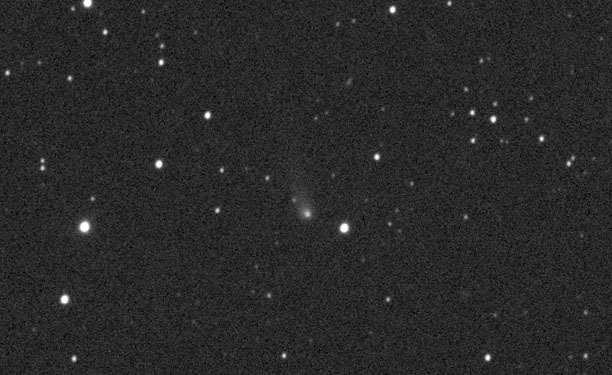 I saved what may become the brightest comet for last, 41P/Tuttle-Giacobini-Kresak. We touched on this one in a blog last November as one of the three periodic comets that making extremely close passes of Earth in the next two years. Come April, as it tears across the northern circumpolar sky, it may max out at magnitude +6 and become faintly visible with the naked eye under rural skies. While that's exciting enough to contemplate, this comet is known for outrageous outbursts. Twice in 1973 it underwent 10-magnitude outbursts! More recently, in December 2001, it shot up three magnitudes unexpectedly. Watch out for this live wire! 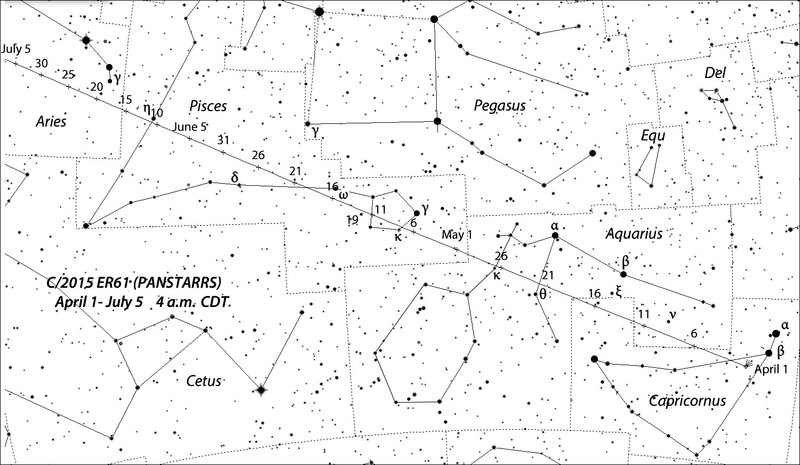 71P/Clark may brighten to magnitude +10 in late spring as it winds through Ophiuchus and Scorpius. Positions plotted every 5 days with stars to magnitude +9.5. As if that's not enough, two other fainter comets will help to fill in any gaps, making sure no one goes home cometless in 2017. They're both periodics: 71P/Clark and 24P/Schaumasse. 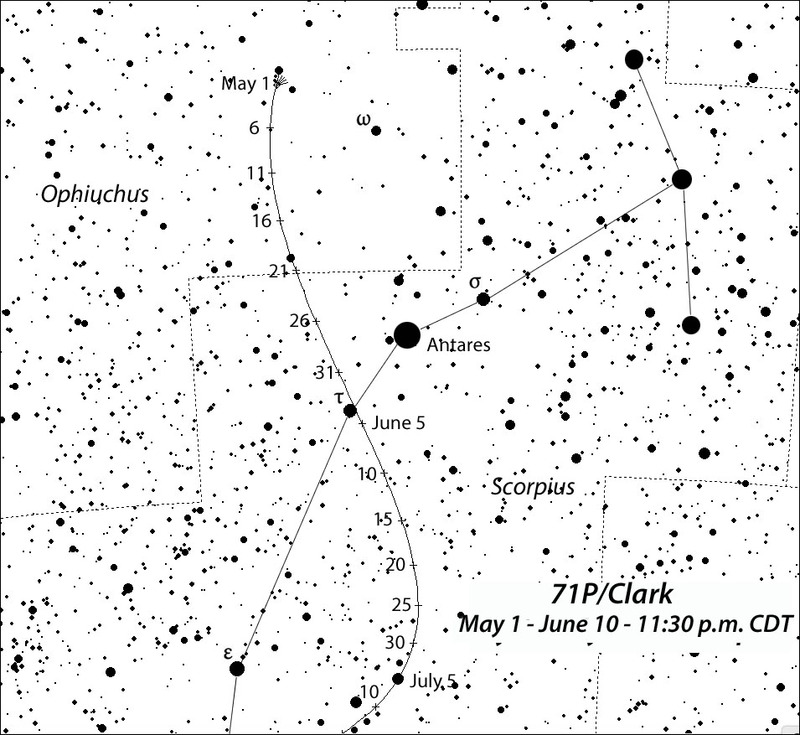 Clark could reach magnitude +10 from mid-June to early July as it describes a lazy S through Scorpius. Southern hemisphere observers are favored, but the comet will still be high enough to catch from mid-northern latitudes during its brightest period. In late May, watch for it to pass just 2° east of Antares. Another one for early birds. 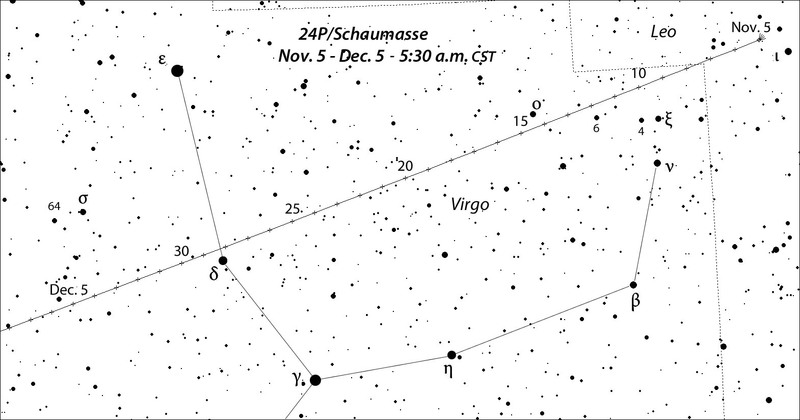 24P/Schaumasse returns after 8.2 years, gliding from eastern Leo through Virgo in the wee hours of November and December. Positions are daily with stars to magnitude +9. 24P/Schaumasse, which returns every 8.2 years, rounds out 2017 with a morning appearance at magnitude +10-10.5 in November and December while tracking across the "Cup" of Virgo, home to hundreds of galaxies, including this mobile lookalike. Comet 41P/Tuttle-Giacobini-Kresak may reach naked eye visibility (magnitude +6) in Ursa Major from a dark site in early April 2017. We see it here on December 23, 2000. Finally, let's not forget the quixotic, exotic and alphabetic 29P/Schwassmann-Wachmann, known for frequent outbursts that can take it from magnitude 14 or 15 to 10 or 11 overnight. You can watch for it beginning in May and watch all the way through year's end as it crawls across northern Capricornus into Aquarius. No matter what your instrument — naked eye, binoculars, or telescope — 2017 promises to be a bountiful year for comet lovers. And that doesn't even include new ones that are just waiting to be discovered!